Vast icy rock peaks tower above Argentina’s Carlini research base in Antarctica. But scientists who have worked here for decades say the glaciers are less icy than they once were. For international experts stationed at the base, the frozen southern continent is a good gauge of climate change. “When I used to come to Antarctica in the 1990s, it never used to rain,” said Rodolfo Sanchez, director of the Argentine Antarctic Institute (IAA). “Now it rains regularly — instead of snowing,” he told AFP during an Argentine government visit to King George Island, off the tip of the western Antarctic peninsula. 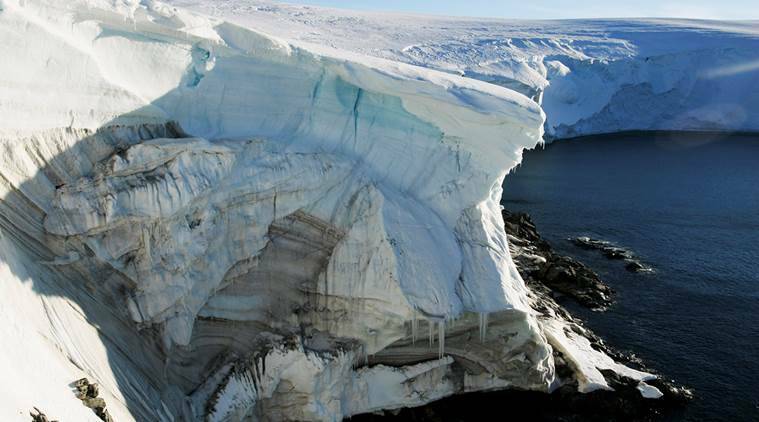 Scientists monitoring conditions at the base say the average temperature here has increased by 2.5 degrees Celsius (4.5 degrees Fahrenheit) over the past century. “The glacier used to reach all the way to the shore,” Sanchez says. “Now there is a 500-meter (550-yard) wide beach.” Dark scars of rock are showing through what were once spotless sheets of white snow on the glaciers’ flanks. “Antarctica is a thermometer that shows how the world is changing,” said Adriana Gulisano, a physicist at Argentina’s National Antarctic Directorate. “There is no place where climate change is more in evidence.” Local wildlife also appears to reflect to the change. Scientists at the Carlini base say a pair of yellow-throated King penguins have swum up to mate nearby for the past three years. Although the theory is not confirmed, they suspect another sign of climate change. The species had previously been thought to be restricted to warmer spots on the Falkland Islands and the Argentine mainland. Various countries maintain bases in Antarctica, a shared space for scientific research under a 1959 international treaty. Former military bases have become laboratories for research into the planet’s future. The Carlini base’s red cabins nestle at the foot of a mountain range known as “The Three Brothers.” Below the structures, the shore is strewn with black volcanic rocks. The population of scientists and military logistics personnel at the 13 Argentina bases in Antarctica can reach 1,000 at busy times. Supplies are brought in by boat or helicopter. Garbage is stored and taken away by an icebreaker. Other kinds of experts are also busy in Antarctica, a continent roamed by dinosaurs 75 million years ago. “The signs are under the ice,” said paleontologist Marcelo Reguero cryptically. He has been working in Antarctica since 1986.